Gruyères is a Swiss village world-famous for the production of cheese but this cute little Alpine enclave has an eccentric surprise tucked up its sleeve. Known for surreal and sometimes disturbing paintings, film props, album covers and – most famously – the mechanical monster from Alien, the renowned Swiss artist HR Giger (1940–2014) moved here in 1997, buying the medieval Château St Germain. The following year he opened the world’s biggest collection of his work in a wing of the castle; not for the faint-hearted, this is no ordinary exhibition but a fully immersive adventure on the dark side of art, made all the more striking by the chocolate-box sweetness of the surrounding village. Among Giger’s weird and macabre SciFi models, props, sketches and drawings for the film sets of Alien, Dune and Poltergeist is some of his graphic erotica, all clearly labeled ‘Adults Only’ and displayed in sepulchral gloom. The exhibition also features a short movie on his life, the Academy Award he won for Alien and artwork from his own private collection, which includes pieces by Ernst Fuchs and Salvador Dalí. 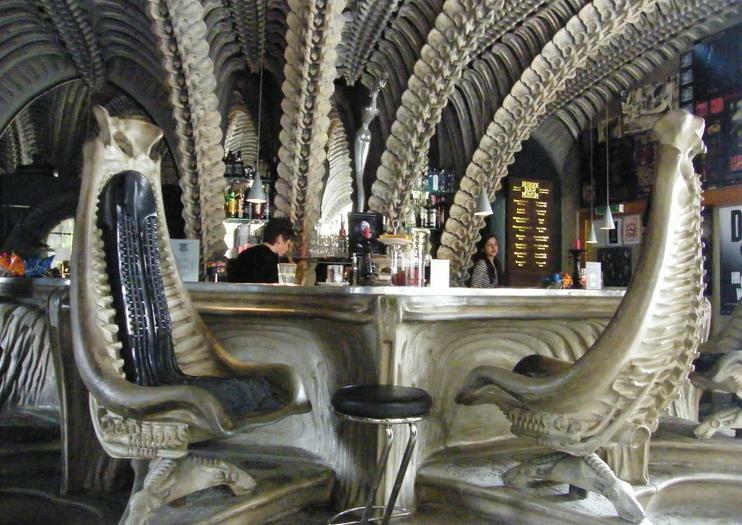 Following a tour of the museum, most visitors head to the cavernous Giger-themed bar for a restorative strong drink. Château St Germain, Gruyères. Open Apr–Oct daily 10am–6pm; Nov–Mar Wed–Fri 1pm–5pm, Sat–Sun 10am–6pm. Admission adults CHF 12.50; seniors & students CHF 8.50; children under 18 CHF 4. Best accessed on foot through the pedestrianized village, which can be reached by rail or by car along the E27 motorway, taking the Bulle exit. Some of HR Giger’s work is unsuitable for young children. Visit Gruyeres’ HR Giger Museum and pay homage to Hans Ruedi Giger, the Swiss painter and movie set designer who was known for his surrealist, and sometimes macabre, work. With your prebooked entrance ticket, you’ll step inside the museum at Château St. Germain to view collections of the artist’s work and his private art at your leisure. Your ticket allows you to stay as long as you like inside the museum.